Finally some good news for Japan. 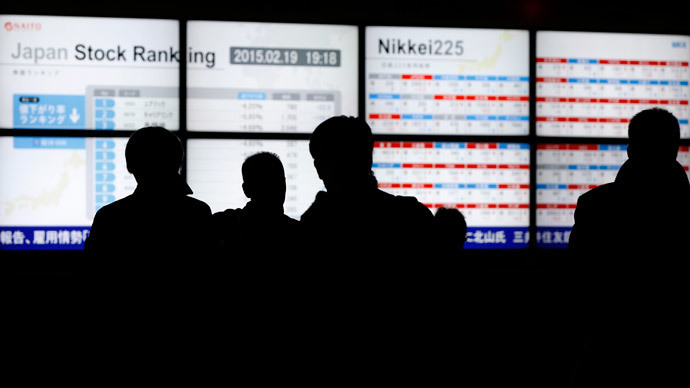 The Nikkei Stock Average hit its highest level since 2000 on the back of a 17 percent boost in exports in January. Exports soared on the weak yen, which lost more than 14 percent against the dollar this past year. The Nikkei reached a peak of 18,322.50, the highest since May 2000, during the intraday session on Thursday after Japan’s Ministry of Finance announced exports had increased 17 percent year-on-year in January, a 5th consecutive monthly increase. Outbound trade was boosted by shipments of cars to the US and electronics across Asia, according to the customs data. Most of Japan's brandname companies- like Toyota Motorcorp, Honda, Mitsubishi, Nissan, Hitachi, and Panosonic are all components of the Nikkei 225. As some social media users reminded, the feat was impressive, but nothing compared to the record high levels of the 'boom' era in the late 1980s, when the Nikkei was nearly twice its current value. The world’s third-largest economy has been plagued by slow growth, which the government has combated with a very loose monetary policy, which has sent the yen to record lows against the dollar and other hard currencies. "Yen depreciation has really made Japanese products more competitive, particularly within Asia, where exports are often transacted in yen," Tomo Kinoshita, chief Japan economist at Nomura, told CNBC. The country is export dependent, so boosting output will help stave a recession. In 2013, the currency lost 20 percent of its value against the dollar, igniting the so-called ‘currency wars’ of countries devaluing currencies to gain an edge on exports. The Bank of Japan launched a trillion dollar US-style quantitative easing program in April 2013 to help get markets and investing back on track, but now faces deflation, with inflation a full one percent below the Central Bank’s two percent goal.